The practice of the devotion to the Holy Face of Jesus is rooted in the tradition that Our Lord left an imprint of His Holy Face on the veil of a woman that met him as he walked to his crucifixion. The sixth Station of the Cross depicts this event. Here the woman known as Saint Veronica, in an act of great charity, wipes the Holy Face of Jesus. Jesus then accepts her humble offering by leaving a miraculous imprint of His Holy Face, an icon made without hands. Catholic Tradition holds that Veronica passed the relic of her veil on to Pope Clement I (papacy 92AD to 99AD). From 1844 to 1847, a Carmelite nun in Tours France, Sister Marie of St. Peter had visions where she saw Saint Veronica wiping the face of Jesus. She also had a vision where Jesus told her: "Those who will contemplate the wounds on My Face here on earth, shall contemplate it radiant in heaven." 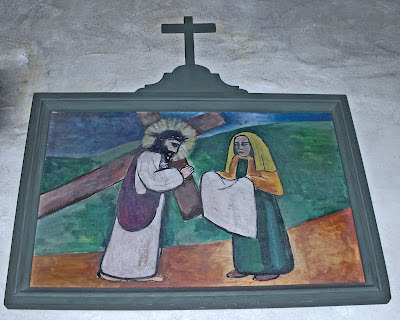 In 1945, Sister Pierina was given many visions of Jesus and Mary urging her to make reparation for the insults Jesus suffered during his Passion. Sister Pierina was given a medal which was a replica of the Holy Shroud. She was able to have the medal cast and distributed to the soldiers during WWII. Sister Pierina was beatified in 2010 at the Basilica di Santa Mari Maggiore in Rome. The Feast of the Holy Face (Shrove Tuesday the day before Ash Wednesday) was established by Pope Pius XII in 1958. History of the Holy Face of Jesus. Novena in honor of the Holy Face of Jesus (begins nine days before the feast day). Devotion to the Holy Face of Jesus.